The green beans and fettuccine were from a dinner with my parents. It made an excellent leftovers for lunch meal. 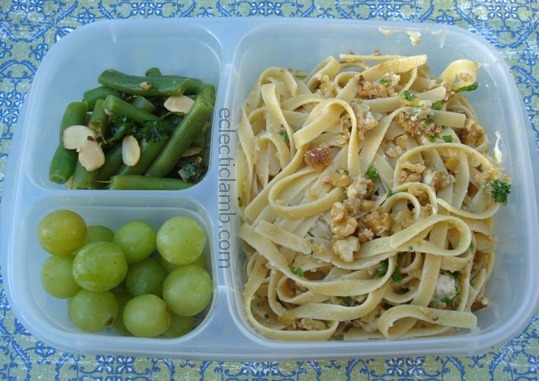 Fettuccine: Blue Cheese Walnut Fettuccine with Toasted Breadcrumbs – I used seeded Rye bread because I had it in the house and substituted blue cheese for the Gorgonzola. This entry was posted in Bento / Cute Food, Food and tagged bento, leftovers, vegetarian. Bookmark the permalink.